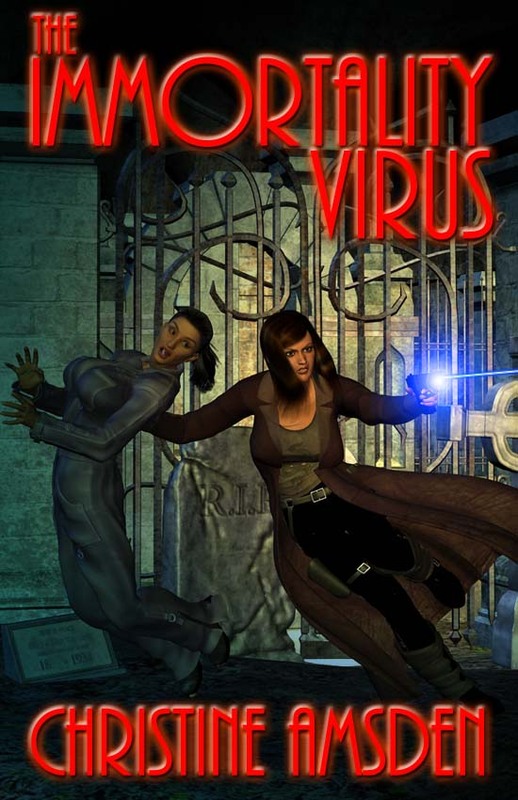 The Immortality Virus is a science fiction tale set in a totalitarian world. It's the future and people don't age as they did before, the only things truly that would hinder a person would be murder, suicide or disease. The streets are packed with people who have no jobs, no homes and no future. When the morality rate always increasing, tensions in The Establishment begin to rise and new and drastic measures are enacted to ensure the populace doesn't reach maximum capacity and every day threatens to do just that. Grace Harper is a 130 year old, pro-death, black-listed Private Investigator hired to find the man who created the immortality virus and she has no clues in which to go on. Her success rate is 50-50 and the only thing she has is a diary written over 400 years ago. Deciding to track down his surviving children and grand-children, Grace begins to unravel the mysteries involved with why people don't age and finds herself one step closer to finding Jordan Lacklin. Jordan Lacklin is a brilliant scientist who was trying to create a cure for Alzheimers Disease in which his wife of 50 years, Margaret, was suffering from. Trying to race against the clock as his two sons, Ethan and Kevin, want to pull the plug on their mother's life support system with a court injunction, Jordan can feel he hasn't much time, after going on a shooting spree in which he allegedly kills all his fellow co-workers, save one, he is never heard from again. He was 76 at the time of "The Change" and is referred to as an "old-timer"...those who were already old when the virus spread and forever captured them in that state of "decay". After heading out of town to follow a lead, something Grace has never done, she is kidnapped and placed on a Farm, a place rumored to turn people into nutri-bars, the number one food staple providing all of their vitamins and protein; only the rich and the elite can afford to eat real food. The Farm is run by the Coopers, old Mr. Cooper appears to be a decent sort, and gives his slaves proper treatment, unlike most other Farms were the slaves weren't even considered people any longer. Alexander Lacklin works at the Farm as a scientist and befriends Grace when she arrives. However, before they can learn from each other about Alex's grandfather, lasers fly and Grace is now a prisoner on the Farm. Not knowing who to trust or where to turn, Grace must keep her wits about her if she is going to survive. I really enjoyed this book and I'm hoping there is a sequel coming because there were many questions not answered in the book and that would be a let down to not have those integral parts of the plot summed up. I quite enjoyed all the characters in the story, they were believable and did not stray off their original content. Author Christine Amsden really knows how to write to keep her reader interested and interacted with the story. I thought the idea of the immortals to be a novel approach and honestly, my imagination of picturing all those thousands of people standing in the park in the middle of January trying to keep warm while they hope The Establishment drops nutribars on their heads from helicopters was quite vivid. I had never thought of a population explosion in such a way before and it was rather disturbing! I was disturbed by the lack of care that these futuristic inhabitants emulated, the empathy in humanity was removed, as people just trying to eat or get warm, are killed without a moment's thought. The distinction between the poor and the elite is almost nil and if you didn't have a garbage can to live in, you can almost be sure your mortality isn't going to be a blessing. I liked the edge the author gave us on such a society. Everyone walked in fear of The Establishment and though we are never really given a glimpse at them, your fear of them arriving in a situation is real and that was very clever of the author, to incorporate such a thought, without ever using them in a situation!! Even though I am not a huge fan about love as a back story, this one works, in order to show how the reader how 50 years loving someone in our regular mortality is a long time and is cherished, however, when you live hundreds and hundreds of years, that same period becomes a blip and love is treated more like a game than an emotion. All in all though, this was a very enjoyable read and I would recommend it to anyone of the sci-fi genre who likes a fresh approach on an old subject! In the mid-21st century, the human race stopped aging. Those who know why aren't talking, and the few who are brave enough to ask questions tend to disappear. To an elite few, The Change means long life and health, but to the increasing masses, it means starvation, desperation, and violence. Four centuries after The Change, Grace Harper, a blacklisted P.I., sets off on a mission to find the man responsible for it all and solicit his help to undo The Change - if he's still alive. To complicate matters, Grace's employer is suspected of murdering his father, and when the police learn of their connection, they give her a choice - help them find the evidence they need to convict Matthew Stanton, or die. But if they discover Grace's true mission, they won't hesitate to kill her in order to protect their shot at immortality.